The spokesman for the I want to pay more taxes campaign has a perfect opportunity to make himself very happy. Apparently his company Berkshire Hathaway is fighting the IRS over payment of back taxes totaling around $1,000,000,000 (that's one billion dollars for people who don't like to count zeros). Just a few weeks ago the Billionaire friend of Obama, wrote an op-ed in the NY Times urging our government to stop coddling the super-rich and support Obama's position that the rich should pay more taxes. At the time many people urged Buffett to start with himself and pay some extra-taxes on his own. Before he adds from his personal account he can urge Berkshire Hathaway to stop fighting the IRS and pay the billion. Americans for Limited Government (ALG) found out about the protracted fight in Berkshire Hathaway’s own annual report, embedded below see Note 15 on pp. 54-56 — the company has been in a years-long dispute over its federal tax bills. To be fair Buffet does not own all of Berkshire Hathaway, just a heck of a lot of it. 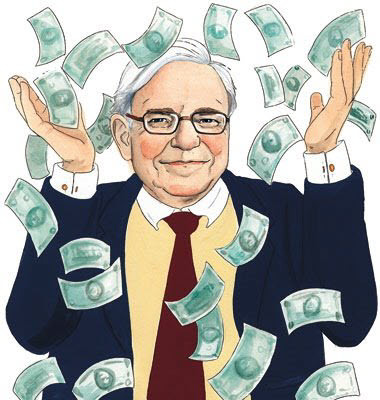 As of July 1, 2009, Warren Buffett owns directly and beneficially 350,000 shares of Class A and 1,501,532 shares of Class B common stocks, which are 33.10% of the outstanding shares of Class A Common Stock, and 10.12% of the outstanding shares of Class B Common Stock, respectively. Buffett has 31.60% of the aggregate voting power of the outstanding shares of Class A Common Stock and Class B Common Stock, and 25.78% of the economic interest of the outstanding shares of Class A Common Stock and Class B Common Stock. According to Newsmax, using only publicly-available documents, a certified public accountant (a CPA but not my wife) detailed Berkshire Hathaway’s tax problems to ALG. “The notation means that Berkshire Hathaway’s own auditors have probably said that $1 billion is more likely than not owed to the government,” the ALG report explained. That $1 billion represents about 0.2 percent of the company’s $372 billion in total assets, according to ALG. Come on Warren, why give all that money to lawyers? The company's own auditors say you probably owe the money. Give the IRS the dough, according to your op ed its the right thing to do. Now, I don't have a few extra billion to spare, but if an IRS agent decided to visit just to tell me I owed them money, the first thing I would do is change my newly soiled shorts, but after that , I would work out the numbers with the agent, come to a deal and pay the piper. The Berkshire board has been just saying no. Perhaps Mr. Buffett should read his own annual report before he tells rich people to pay more, since he looks a bit foolish when his own company is not paying enough. If you would like to read the key parts of the Berkshire Hathaway Annual Report it is embedded below.